Breaking the cycle of poverty through a trauma-informed care perspective will be the topic of conversation at the biennial Coming Together: The Cycle Can Be Broken conference presented by Corteva Agriscience on Thursday, April 4 at the Chase Center on the Riverfront. “This year’s Coming Together conference recognizes that when kids and their families face foundational challenges, each adversity deepens all of the others in a geometric – and often generational – erosion of opportunity. 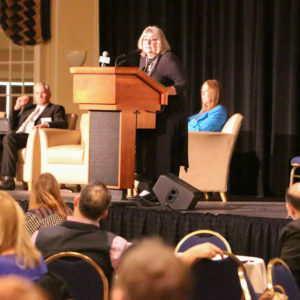 So to be effective and to be efficient, efforts to alleviate those challenges must also be inter-connected and mutually reinforcing,” said Delaware’s First Lady Tracey Quillen Carney and conference chairwoman. “At the Food Bank of Delaware, we know that hunger does not exist in a vacuum. It’s the result of a multitude of issues, many of which stem from trauma. By exploring these issues from a trauma-informed care approach, we can not only work to better serve our clients in a way that addresses their physical and emotional needs, but also work to break the cycle of poverty,” said Food Bank of Delaware President and CEO Patricia Beebe. Breakout sessions will feature programming in three areas – behavioral health, topics related to youth and underrepresented populations. This conference has been approved for four CLE credits by the Delaware Commission on Continuing Legal Education and three CPEUs from the Commission on Dietetic Registration. In addition to adult programming, the day will also feature programming for Delaware’s school children. Students will visit stations focused on healthy eating, fitness, the legislative process, food insecurity, gardening, shopping on a budget, food waste and more. When: Thursday, April 4; 8:30 a.m. – 3:15 p.m.